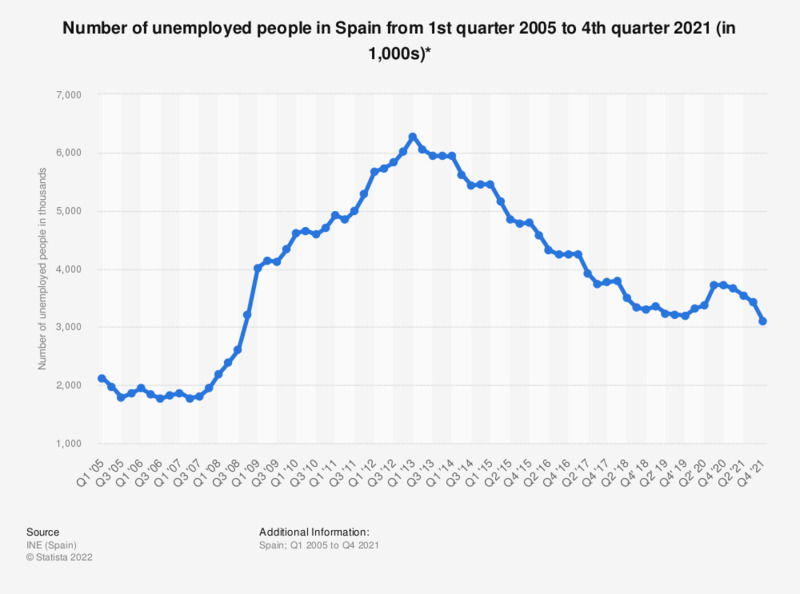 This statistic displays the number of unemployed people in Spain from 1st quarter 2005 to 2nd quarter 2018. During the analyzed period of time, the quarter that experienced the lowest number of unemployed people was Q2 in 2017, in which the amount of people without a job amounted to approximately 1.7 million. This figure however increased sharply and the number of unemployed people rapidly reached over 4 million during the first quarter of 2009. Spain saw the highest peak of jobless population during the first quarter of 2013, in which people without work accounted for more than 6 million. The situation improved after this peak and initiated a downward trend, with unemployment standing at approximately 3.4 million persons in the second quarter of 2018. * The source adds the following information: "The Economically Active Population Survey (EAPS) has been conducted since 1964. The methodology currently in force is that of 2005. It is a quarterly continuous research focusing on families, whose main purpose is obtaining data on workforce and its several categories (employed, unemployed), as well as on population out of the labour force (economically inactive population). The initial sample is about 65,000 families per quarter, which equals approximately 180,000 persons."